[Photo essay] People living here face disease-carrying mosquitoes and flies instead of bombs and bullets. 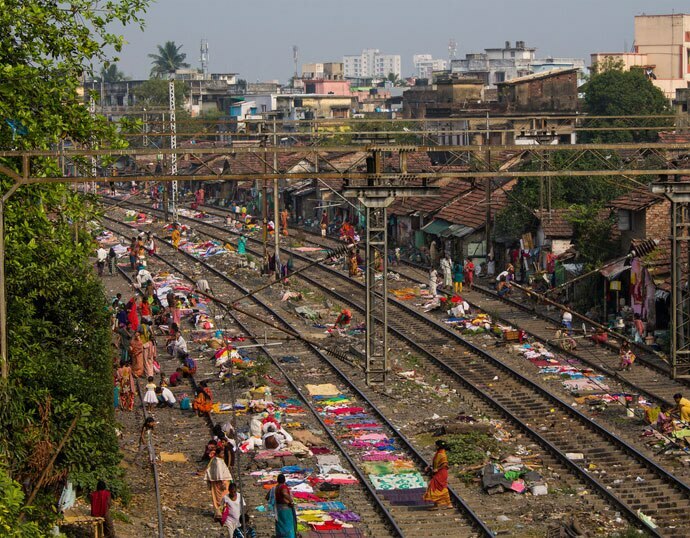 When I first started exploring South Kolkata on foot, I soon discovered the Dhakuria Bridge and the Railway Colony emerging from its shadows below. There's a great overhead view of this impoverished community from the east side of the pedestrian crossing. 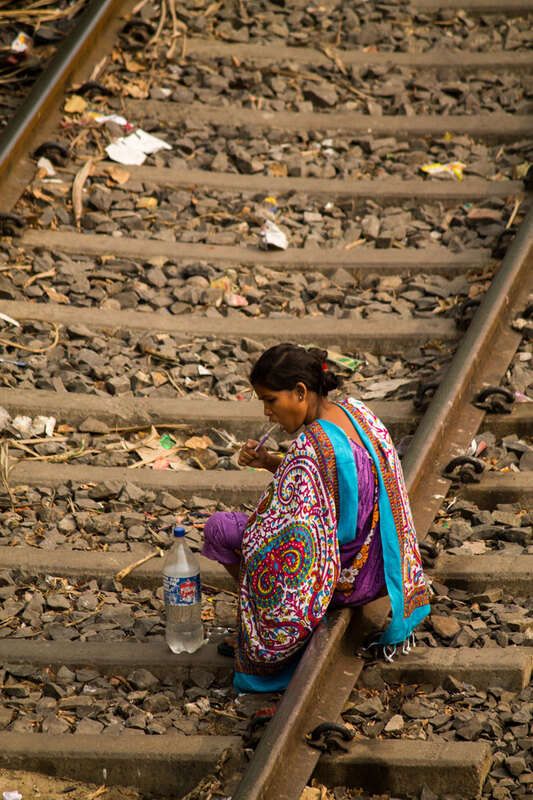 It's only when I see all the wonderful colors emanating from the railroad ties and tracks – contrasting with all the dull, gray stones, garbage, and what must be a plague of hungry flies attracted to the sewage-scented breeze – that I'm reminded that these people live their day-to-day lives in what could be described as an autonomous region. The visual truth speaks volumes for this argument; and there are far worse fates than being symbolically cut-off from the monochromatic scheme of politicians inflicted with an infantile obsession for painting the town blue. 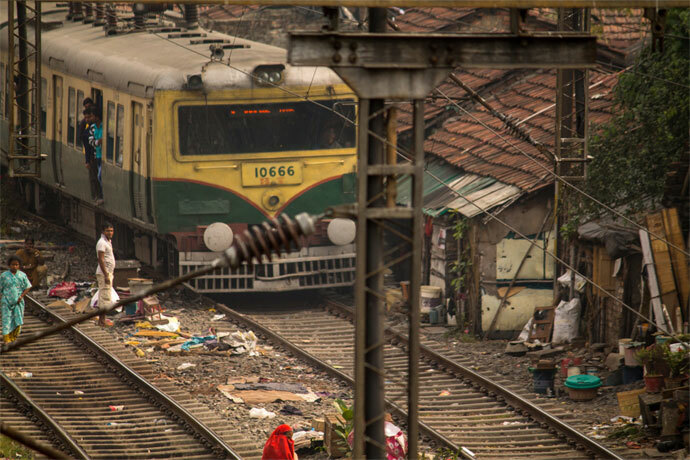 There's a life-and-death struggle on the railroad tracks in Kolkata which has largely gone unnoticed in India and the world. Shouts of warning span the tracks when there's an inbound train. 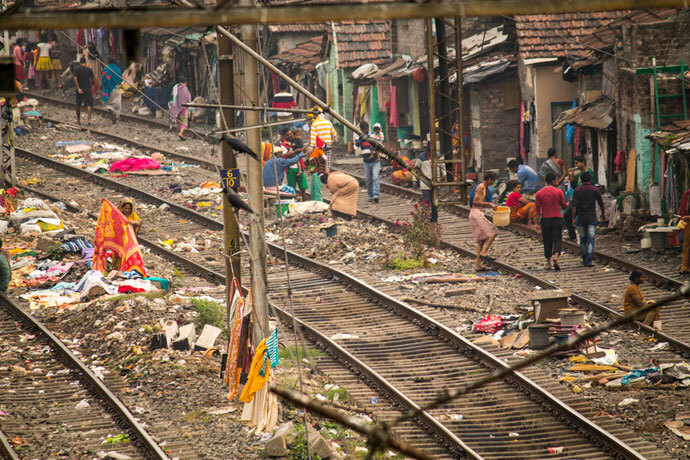 There's very little room to manoeuvre on the south side, where makeshift housing hugs the rails. There's a promise of a quick death or an awful maiming for anyone caught unaware on colony grounds. The existential threat is very real. 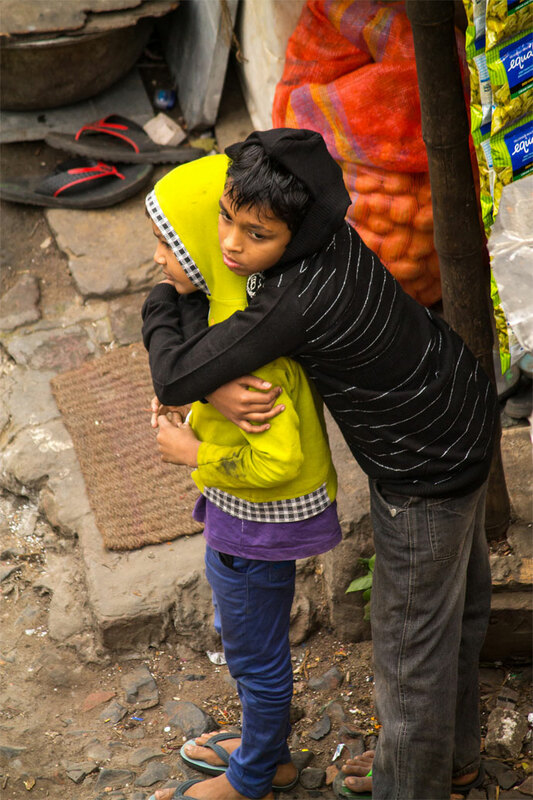 Unlike the threat of fatal terrorist attacks, which statistically speaking, is less likely to happen to you or me than say, being killed in a bathtub in the US or by the ubiquitous air pollution enveloping India's mega cities (which West Bengal politicians have still not yet figured out how to paint blue), death and injury-related train accidents occur very frequently in India on the order of 15,000 fatalities or so annually with many more thousands injured. The absurdity of death-by-train could drastically be reduced to something like a few hundred deaths annually (like in the United Sates) with a fraction of the defence budge earmarked for combating "terror" in India. But that's not a publishable essay short of some fantastic journey to a reality-bending black hole featured in the movie, Interstellar. Then you'll have to pluck an enlightened middle-class audience from somewhere in the remote reaches of the multiverse who actually give a damn. 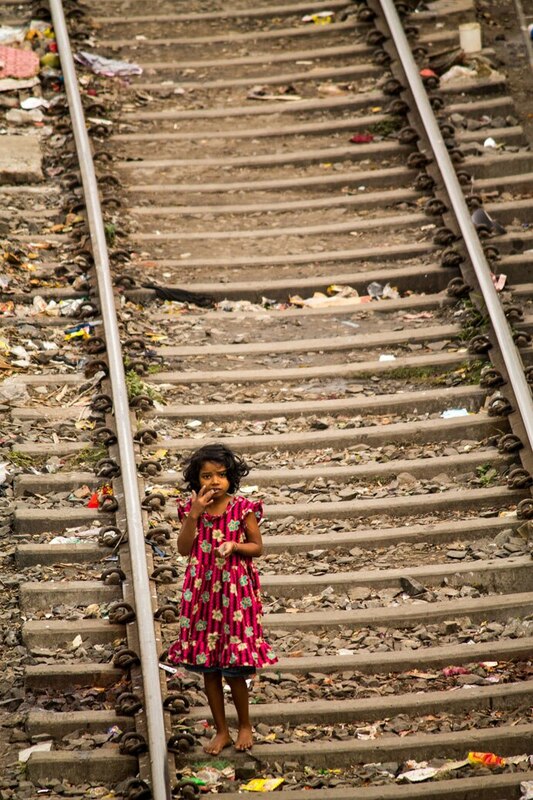 Raising your children on railroad tracks is right up there with risks faced in war zones. Instead of facing bullets and bombs, there are disease-carrying mosquitoes and flies. 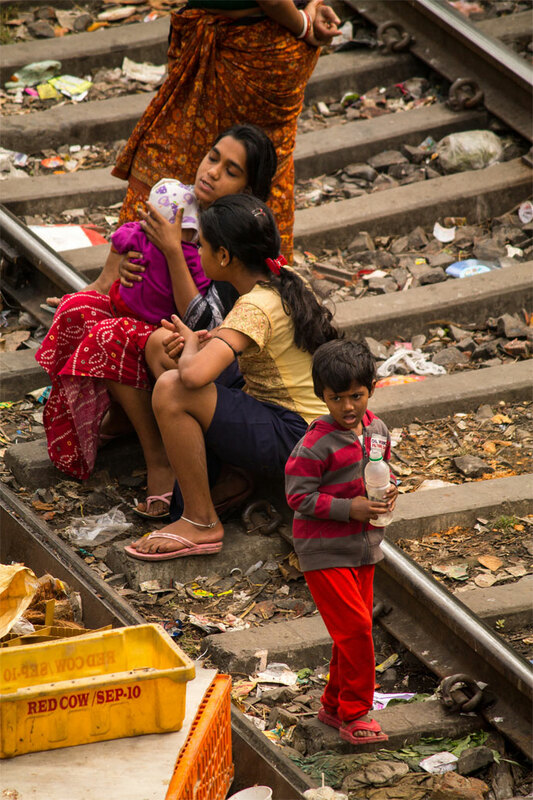 The water is either contaminated or risks contamination if it isn't boiled adequately, making diarrhoeal disease – the second largest killer of children under 5 years of age globally – a grim possibility. 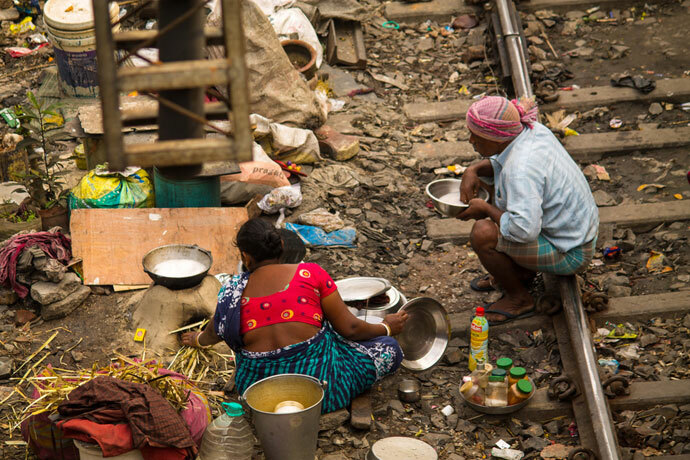 Food is consumed dangerously near faeces in an area that appears to function as an open-air toilet. 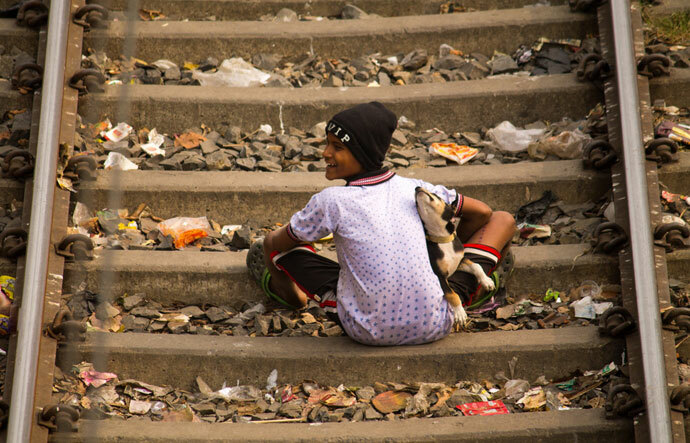 I witnessed several children urinating in places close to where either laundry was drying or food was prepared. Easily treatable colds and flus (and numerous other viruses) likely go unattended a majority of the time in a cash-poor populace that counts itself fortunate when there is available or affordable food. Death by train may be quick and considerably less frequent, but it's the silent and long-term health risks that are more lethal for adults and children living in such conditions. 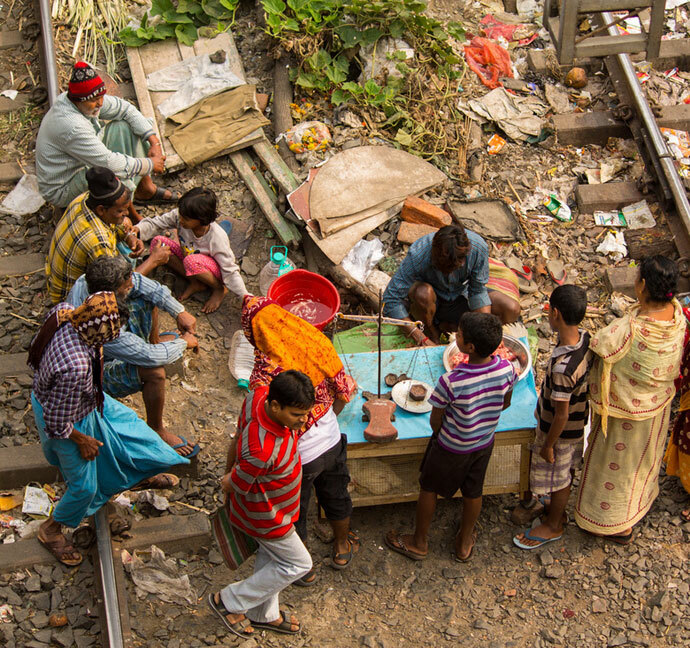 Life goes on at the Railway Colony at Dhakuria Bridge. It's not all misery and drudgery there, which some people mistakenly or intentionally mislead us into believing in their attempts to raise awareness and money for the cause. It's empirically not what I witnessed nor what I photographed and present to you here through images. The truth is somewhat obscured ... although quite apparent with some effort put forth to try and comprehend the reality in front of our very noses when we view experiments in failed humanity thriving from the top of a dilapidated bridge. Protagonist Randal McMurphy expresses as much to Chief in the Ken Kesey novel, One Flew Over The Cuckoo's Nest. "You had a choice: you could either strain and look at things that appeared in front of you in the fog, painful as it might be, or you could relax and lose yourself ..."
But we shouldn't be fooled into believing that a little joy conceived in man-made hells-on-earth excuses us from taking direct action in eradicating problems largely caused by ruling elites. We have a choice, we can take action, incremental steps or otherwise, or we can choose to lose ourselves in the glossed-over worlds painted blue by the failed artists in office. McMurphy certainly doesn't rule out the happy-go-lucky ignorance offered as an alternative right at the end of that very sentence. "... Being lost ain’t so bad."